Taraji P. Henson is receiving her flowers while she's still here for the philanthropic work she's putting in to help raise mental health awareness in the black community. Yesterday, the "Empire" star was honored at Variety’s sixth annual Power of Women New York luncheon at Cipriani, presented by Lifetime. Before heading inside, "Grown-ish" actress Yara Shahidi caught up with Taraji on the carpet and had a total fan girl moment. All hail the queen! The 48-year-old actress - who's new movie The Best of Enemies hit theaters yesterday - rocked an Off-White ensemble from the brand's FW19 ready-to-wear collection. 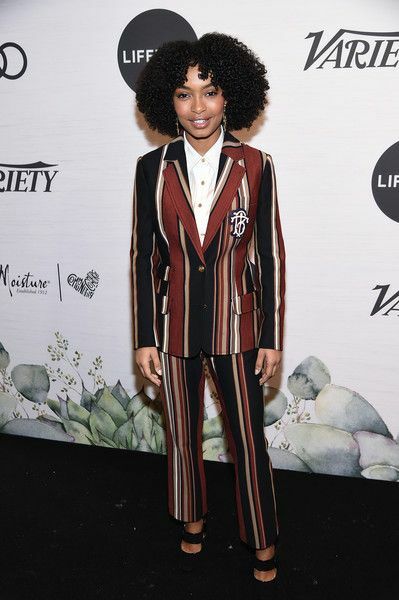 Yara pushed through in a stripped Tory Burch power suit for the event. By the way, she's starring in a new movie titled The Sun Is Also A Star, which hits theaters May 17th. Peep the trailer HERE. Inside, the honorees shared stories about women overcoming obstacles, proving naysayers wrong, and fighting injustice. During her acceptance speech, the Proud Mary actress was brought to tears while talking about the struggles the black community is faced with when it comes to mental health since it's so taboo. She's working to break the stigma about mental health in the black community with her mental health foundation - Boris Lawrence Henson Foundation - which she started in honor of her late father who suffered from mental illness after fighting in the Vietnam War. Taraji P. Henson also nabbed a cover on Variety's Power of Women issue. PREVIOUS: INVESTMENT OR MANSION? Cardi B & Offset Buy Up Half A Block For Only $200K!